How does Sidisi,-Brood-tyrant's second ability work? Mesmeric Orb + Sidisi Brood Tyrant = How Many Zombies? Nice too hear that you like it. Heartless summonings is a great card but I love my Spore Frog way too much and it sadly kills this little guy. 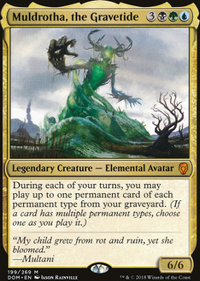 For lanfall I would go with the usual landfall creatures like roil elemental, baloths, avenger and Hedron Crab . 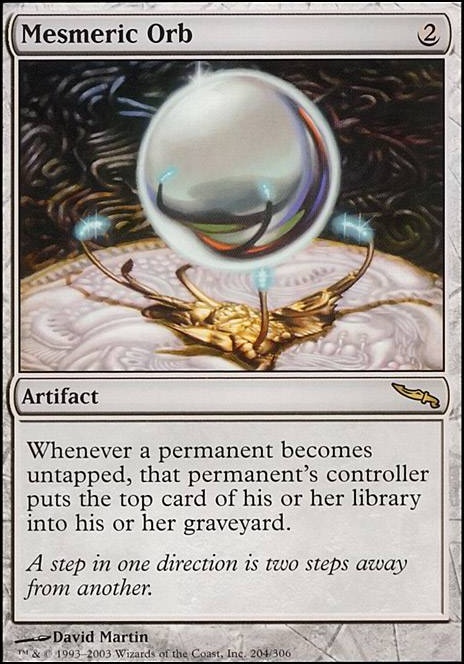 Throw in Crucible of Worlds , Ramunap Excavator , Azusa, Lost but Seeking , Oracle of Mul Daya , Mesmeric Orb and some fetchlands. 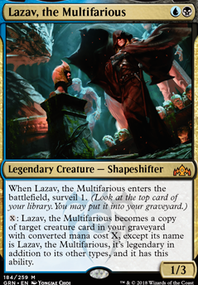 Mill yourself to have always access to enough lands and get value of your 3-4 landdrops each turn. World Shaper should be a must and maybe Scapeshift is worth including aswell. My favorite Yuriko list on the site is The Shadows Have Claws, which inspires a lot of my comments here. 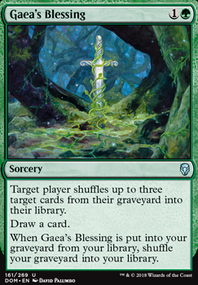 I think the natural question here is whether the deck plays well enough without Arcane Adaptation and friends. 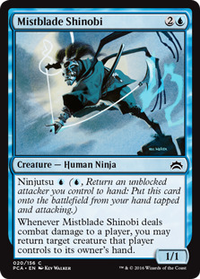 The deck seems rather reliant on them, since there simply aren't that many good Ninjas printed, but you also aren't playing any tutors to find them. 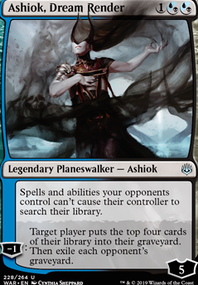 I'd try to get your hands on a Demonic Tutor (they're as cheap as they're ever going to be) and possibly a Vampiric Tutor / Mystical Tutor (which also let you put something with high CMC on top for Yuriko to grab). Beyond that, I'd try to get more top-deck control (particularly Brainstorm , which is FAR better than Dream Cache , and Scroll Rack ). You're not running some of the best mill options out there, such as Mesmeric Orb , and I think that Animate Dead / Necromancy would serve you well here. Mirror-Mad Phantasm , Jace's Erasure , Mesmeric Orb , Hermit Druid . put 0 basic lands in your deck if you use that last one. The thing is... It's so easy to go infinite with Teshar. You only really need two pieces and it's over: Skullclamp and Ashnod's Altar. The ridiculously low CMC of the deck allows you to play it all practically on turn 3. But it's a good point about Rest in Peace. I didn't see the bottom half of the card, and that is indeed pretty terrible for Teshar. How often is it run in the cEDH scene ? As for Mesmeric Orb , games shouldn't be going on long enough for it to have lasting impact. Unless you run Clock of Omens or Dross Scorpion , I fail to see how this helps you win. Is it instead to punish opponents' untapping shenanigans ? You'll want to avoid spells that self mill and go for creatures that do it instead. Several cards do this: Satyr Wayfinder , Splinterfright , and Hedron Crab . Another good card is Tracker's Instincts because it will replace itself. You've also got Gnaw to the Bone for a lot of life. If you have a lot of money, Mesmeric Orb does a lot of work.